For a long time I’ve experimented with shaping my upstream traffic via Linux’s traffic management functionality (tc command) with the goal of improving my Internet connection’s performance. The latest incarnation of this configuration can be found in this script. Anecdotally this configuration greatly improves interactive performance. Use cases such as Skype calls work without a hitch with any other network tasks I want to run at the same time. In this post I provide some simple experimental results and compare against the default configuration. 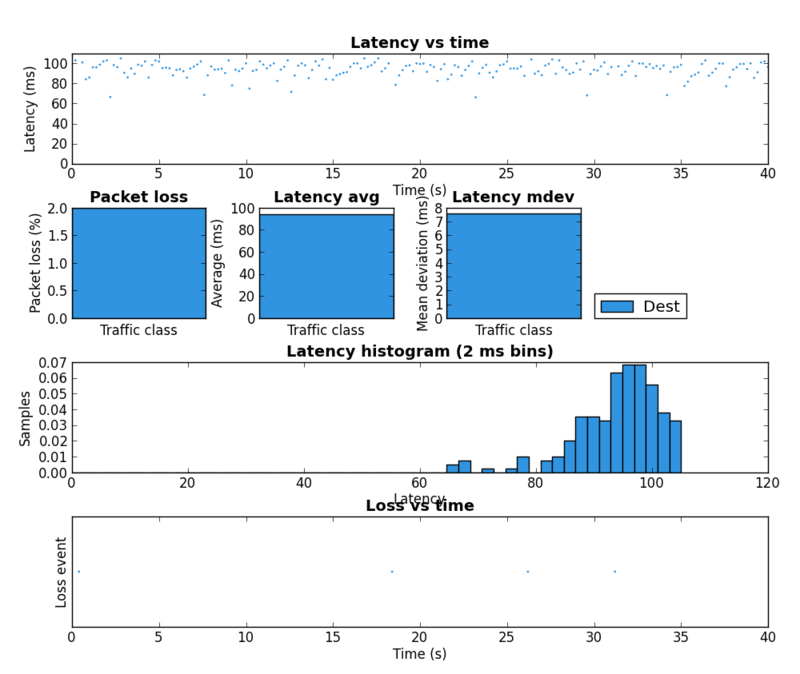 The goals of the linked tc script are twofold: improve performance under load and stop any single host from monopolizing the available bandwidth. 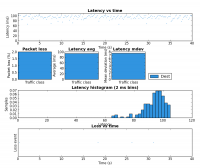 Performance under load is improved by shaping to just below the link bandwidth which stops packets from queuing in the DSL modem and thereby allows the Linux QoS features to manage the traffic. 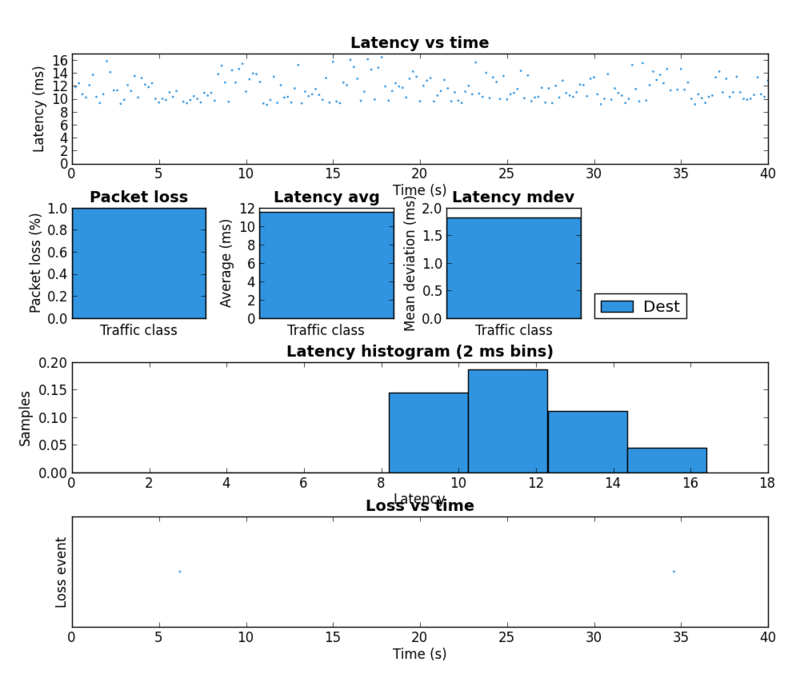 Achieving host fairness is accomplished by hashing the hosts on the network across a set of buckets. Flow fairness is accomplished via the underlying fq_codel QDisc. Figure 1 shows the layout of the network. Note that when I performed these tests I didn’t disconnect all other devices so these aren’t perfect lab style results. The fist test involves running iperf set to 200kbps and 500 byte packets. This is meant to be somewhat similar to what an interactive application such as a Skype call would produce. The second test used my pingexp utility to chart the ICMP ping results. For both, six different load scenarios were tested (the rows in the table). In both cases the base load was generated from HostA and the test load was generated on HostB. Notice the large decrease in latency between rows 3 and 4. This is the result of shaping to below the link rate which stops the buffer in the DSL modem from filling. The biggest improvement can be seen the last two rows of the table. 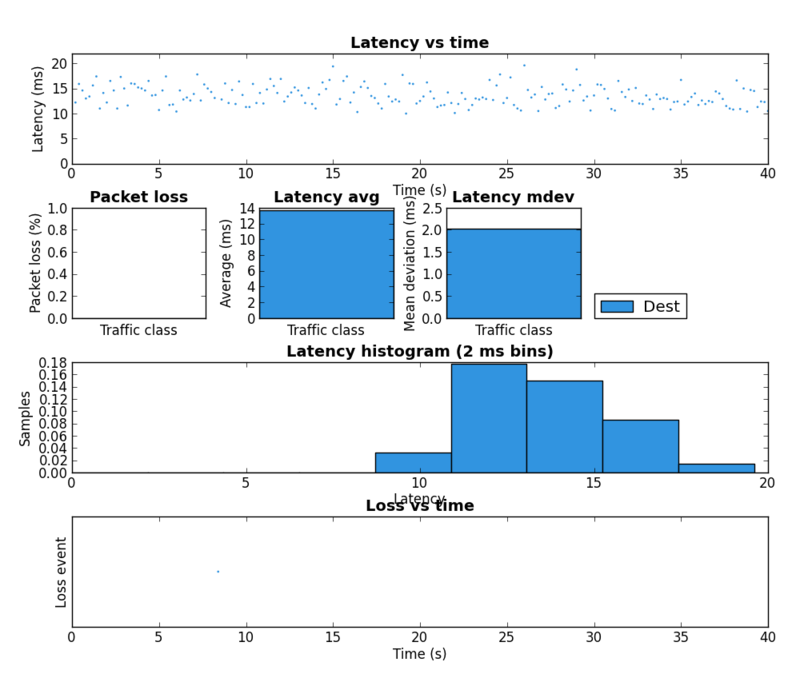 Without the tc script there is a large amount of packet loss but with the tc script in place HostB’s traffic is affected very little by HostA’s. Due to the use of fq_codel as the underlying QDisc, it is very likely these results would be very similar if both iperf instances were run on HostA but this was not tested. The third experiment duplicated the six load scenarios above but instead used a single scp transfer on HostB as the test load. 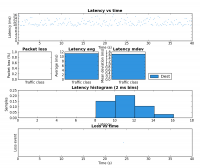 Figure 1 shows the result as captured and charted by Wireshark. Each of the six scenarios were run for approximately 20 seconds. The region marked A corresponds to the two unloaded scenarios (rows 1 and 2 in the table above). As expected there is little difference as both scenarios max the upstream link when there is no contention. Notice how much the rate drops in region B (row 3 in table) when the three scps are started on HostA. The bitrate is approximately 1/4 of the link rate which is expected since there are four scps running. Region C (row 4 in the table) has the same four scps but with the tc script in place HostB gets 50% of the link rate and therefore HostA’s three scps share the other 50%. 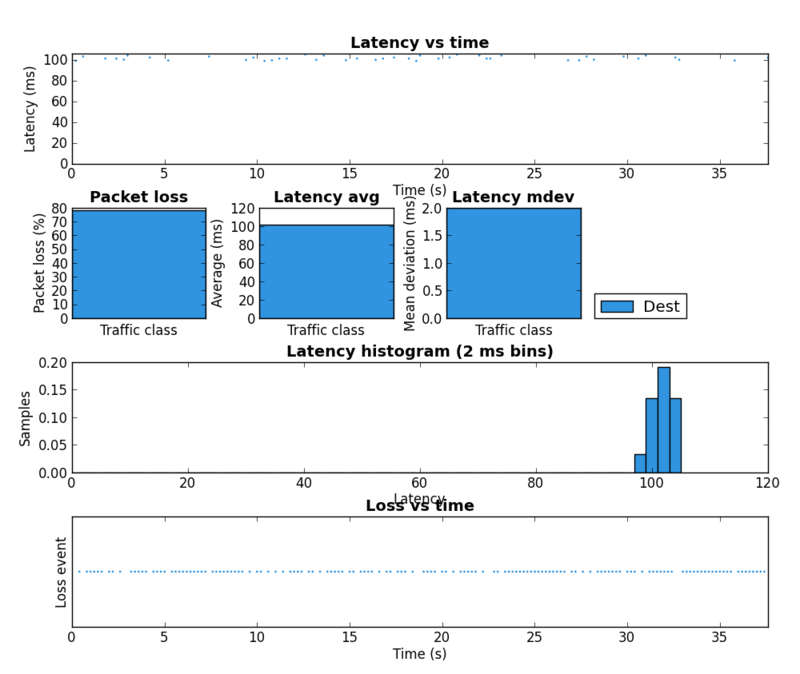 This shows that the tc configuration achieves per host fairness in terms of bandwidth allocation. Region D should be ignored as it is the result of me taking too long to setup scenario 5. Region E (row 5) is very interesting. This is where the 8Mbps iperf UDP flood starts. Notice that the scp from HostB is completely drowned out and is effectively unable to transfer any data. This is an extreme example of the kind of dramatic performance drop under load which many have come to expect from busy Internet links. As we’ll see in region F, this is not a fundamental problem with the Internet, it is the result not properly managing the buffers. Region F (row 6) consists of the same traffic as region E expect the tc script is now in place. Like region C, HostB is now getting 50% of the available bandwidth even though HostA is trying to transmit at a rate higher than the total link rate. 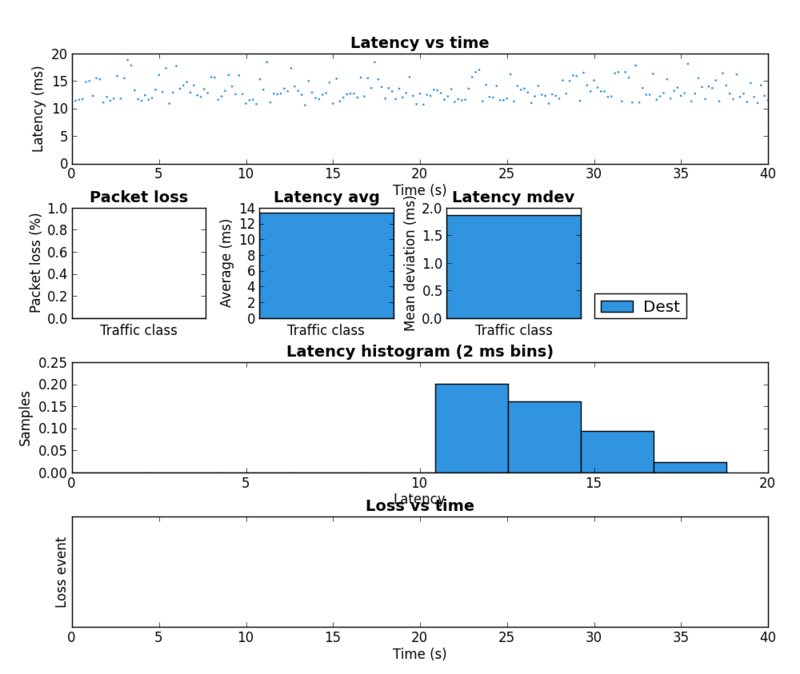 This shows that a bit of active queue management can make an Internet connection usable under high load. To get a sense for what difference the tc configuration makes to web performance I ran Google Chrome in benchmarking mode for the same six scenarios. The results are presented in the table below. I have marked the entries in row 5 as failed because after 120 seconds a single page load had not yet completed. Like above, the interesting rows to contrast are three and four as well as five and six. In both cases the tc configuration greatly reduced the time required to load www.google.ca. This post presented results which showed that the performance and predictability of a DSL residential Internet connection can be greatly improved with some basic traffic management running on a Linux router. If you don’t have a Linux router you may still want to take a look at the configuration of your home router. If it supports bandwidth shaping, try setting it to just below your link rate. The results won’t be as good as presented here but it should make a noticeable improvement. Finally make this script work on Linksys E3000 DD-WRT (Kong’s K26 r21661 with OTRW2 enhance, kernel 2.6.24.111). Tomato not support fq_codel and most DD-WRT can’t make bash work or show error message. Only Kong’s K26 DD-WRT works perfect. Qos effect need further test. And thank you for this great script !